A Visit to Vic and Al’s – Run. Ride. Roam. With a crisp clear morning and a touch of blue sky, I couldn’t pass up the chance to go for a run, so run I did. Steve came with me on the bike and I ran alongside the Thames, looking across at Docklands, watching the varied water traffic going up and down and watching the commuters heading off into their day. I passed some spots along the river that looked familiar and I’m sure they were TV locations. They looked just like the spots where dead bodies always turned up on The Bill or Law and Order UK or Spooks. No TV cameras around this morning, but I did look! 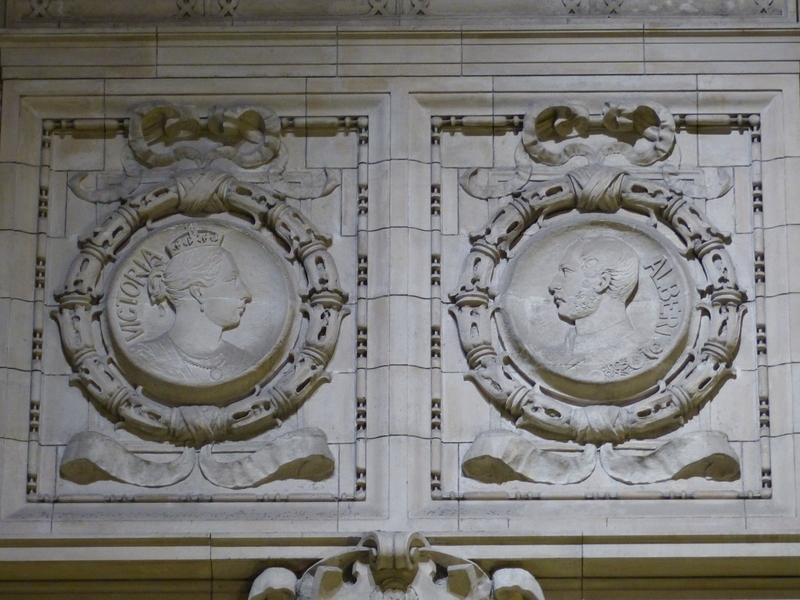 After a pleasant plod, we spent some time doing some housekeeping and then caught the tube again, to spend some time with Victoria and Albert. 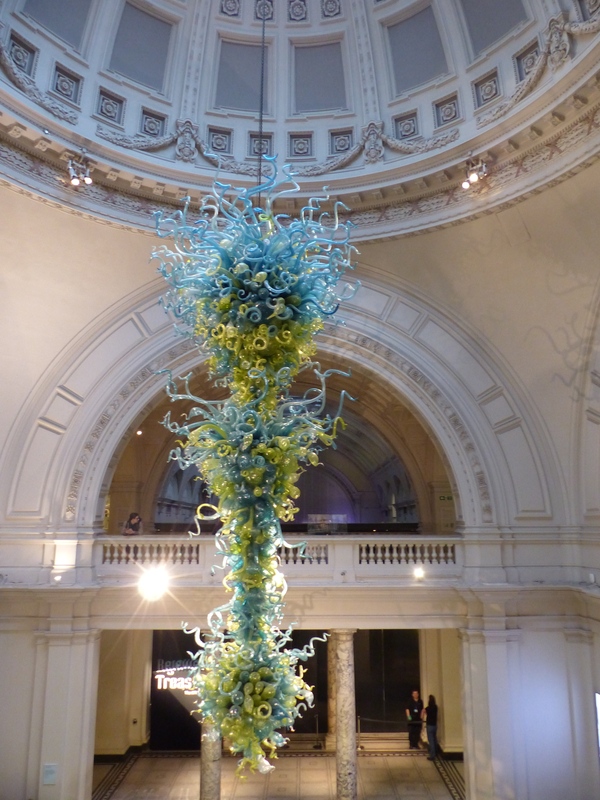 The V&A Museum was one we wanted to see on our last visit to London, but the lines were so long and the rain was so heavy, that we chose not to wait the few hours necessary in the cold and soggy conditions. Today, we took the underground entrance, straight from the tube and not a queue to be seen. What an amazing museum! This is one of the best I’ve been to. We actually decided early on in our visit, that we’d be returning tomorrow, so we didn’t have to rush and whatever we didn’t get to see today, we’d come again and see tomorrow. Spending a few hours here was really the only other thing we did today, partly because it was an interesting visit and we took our time, but also because the early morning clear, blue, sky hadn’t lasted long and it was pouring with rain, so roaming wasn’t going to be too much fun anyway. So all I shall do now, is just share some of the exhibits that took my fancy as we strolled through this wonderful museum. 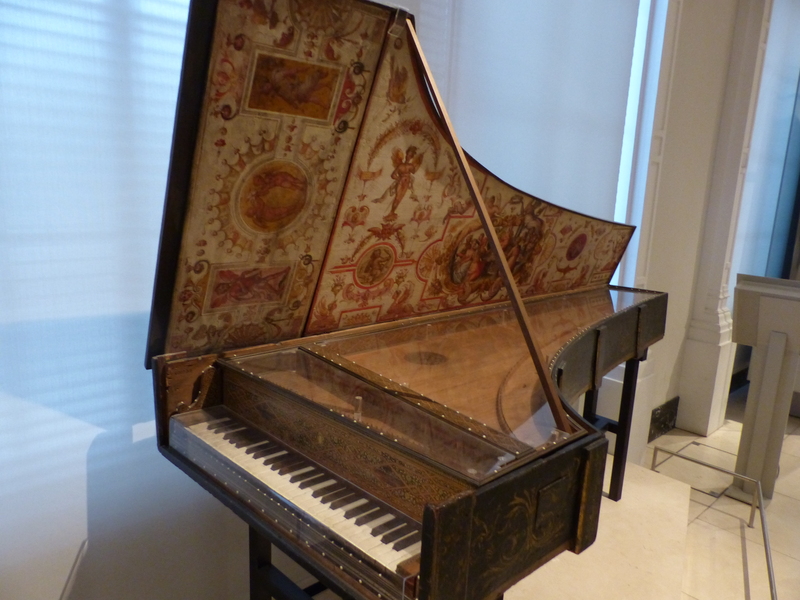 Another connection clicked into place when we saw this harpsichord. It belonged to the Strozzi family from Florence. We visited Palazzo Strozzi when we were in Florence and walked around the beautiful internal courtyard. 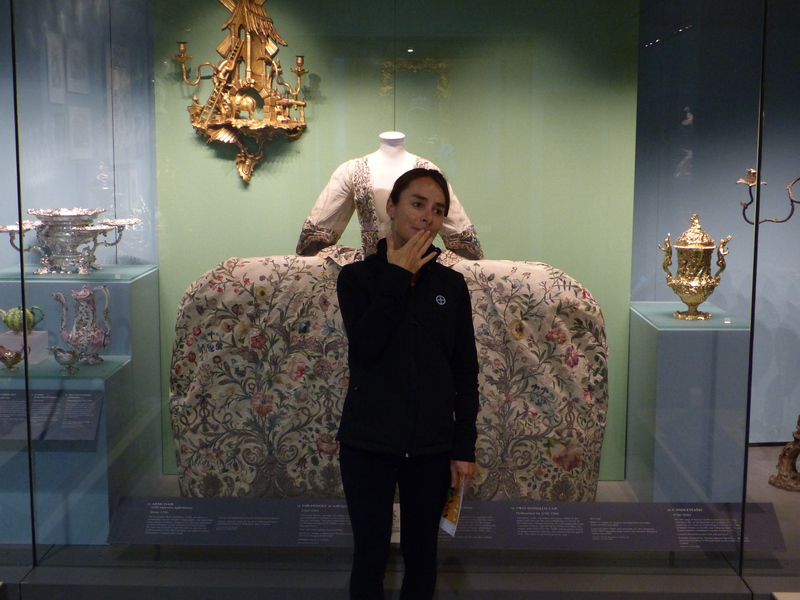 Now here we were in London, seeing an item that was originally in that Palazzo, centuries ago. 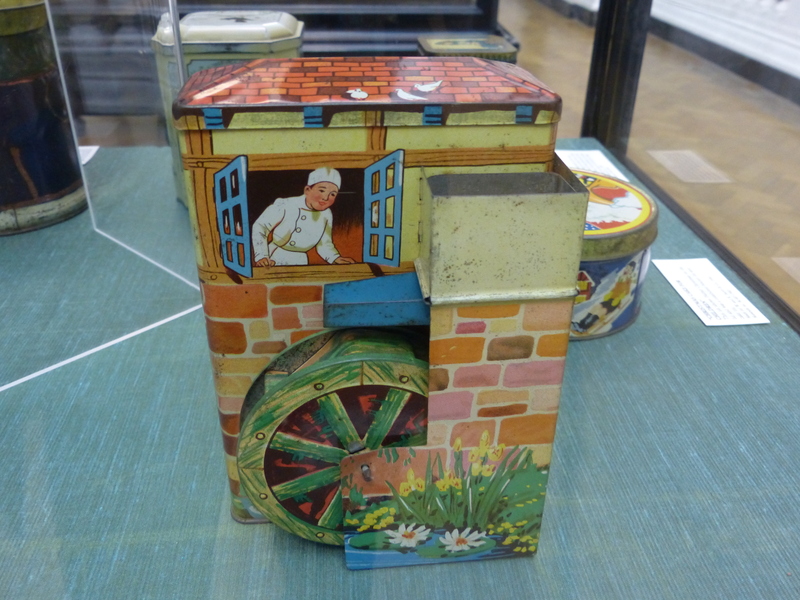 I loved this biscuit tin, which when it was finished being a biscuit tin, was a toy water wheel that could be played with. Why don’t they make things like that anymore? Why does everything have to be cheap and nasty and throw-away? Why can’t we still make things that are functional, but have some art or style, or longevity to them, not to mention a sense of fun. Why can’t we still have that? What a grand piece of glass art. This was simply spectacular, hanging from the beautiful domed ceiling. I’d seen lots of pictures and period movies of women wearing those dresses that stuck out to the side and were worn at court; I had no idea how wide they were though, until I saw one today. Fair dinkum! 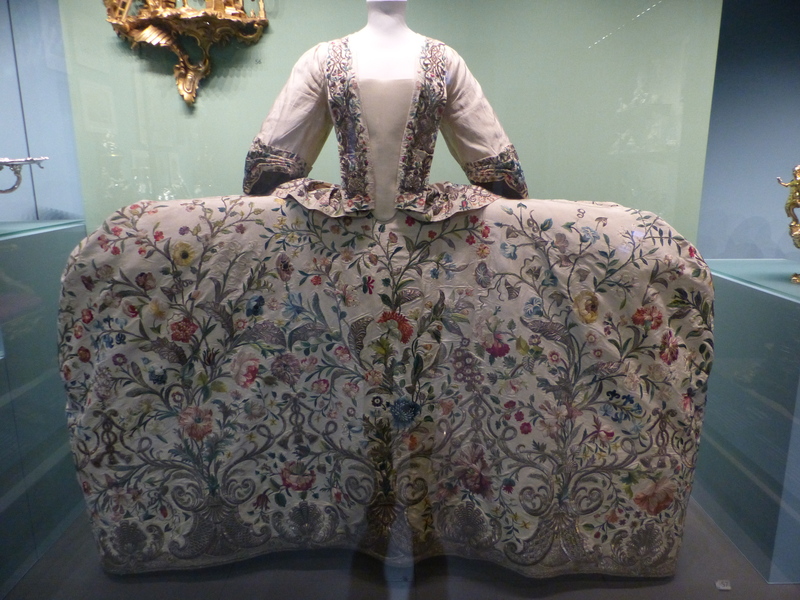 I think this style was the fashion item that coined the question, “Does my bum look big in this?” This dress is from the 1740’s and the wearer did indeed have to walk sideways through doors. The idea was to display as much of the lavish decoration as possible, hence the width, but talk about fashion before comfort! Tee hee hee…What’s that you say? I have a dazzling derrière? Oh Lord Snodgrass, you do tease one so. I think it’s been fairly well established to this point, that I am a tea drinker! I do like my tea, in fact I like several mugs of it a day when I can. 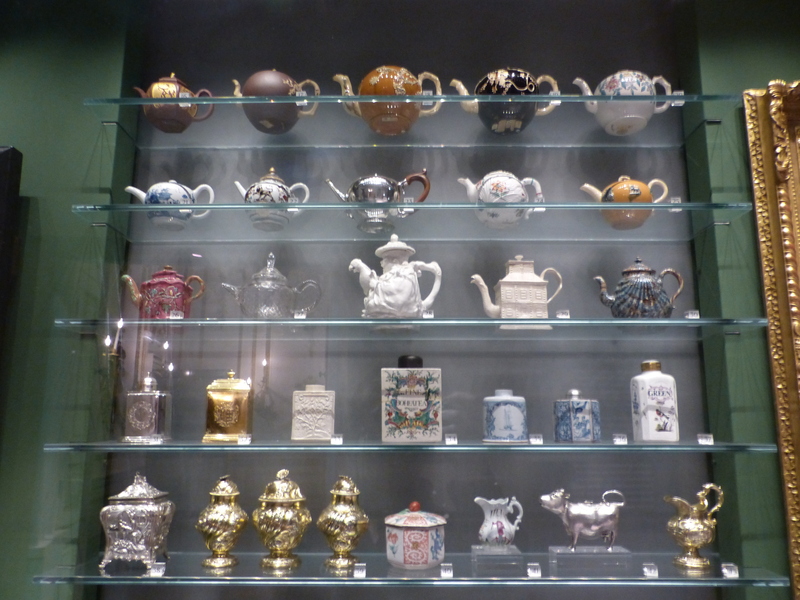 So, I was of course drawn to this display of teapots and the exhibit about Tea Time. Tea Time was used to teach genteel behaviour and manners to young girls and ladies (shame that purpose bypassed this scruffy gal!) and was an important occasion for elegant sociability. Through the 1700’s tea drinking became increasingly popular, although doctors actually cautioned against it! In polite households, tea was served in the drawing room after dinner and the lady of the house presided over the service. Early on, tea was served in the Chinese manner, without milk, but as it became more popular, it took on new habits and ways of being served. As I looked around at the tea services and paintings of “tea time” in period England, I did ask myself, if England has such a rich history of tea consumption, why, oh why, are they now so darn hooked on tea bags!? Bring back the leaves people! Learn to love the leaf again! Bag the bag! I was quite taken with this statue of Saint Roch, patron saint of plague victims. The story goes, that while in Italy he caught the plague; a dog found bread and brought to him and it was this regular feeding from the dog, that helped to keep him alive. 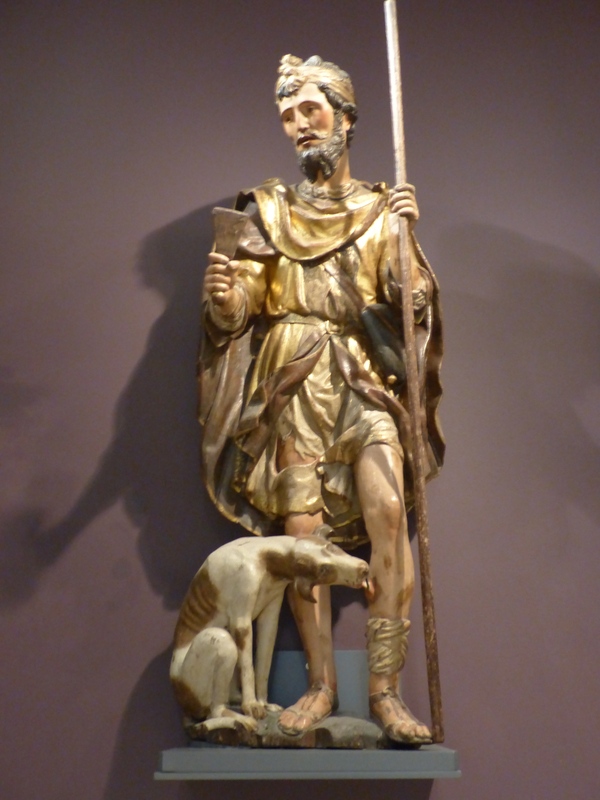 In the sculpture, St Roch is holding a clapper, which was used to warn people of his presence, so they could stay away and the dog is licking the open sores on his leg. He was reputed to have miraculously cured those suffering from the plague, hence the status of Saint. I just really liked the image of that little dog, being so kind to him, which was something that I don’t think his fellow humans would have been, given his condition. All through history, animals have done such amazing things for us, and here was a scene of such loyal behaviour, depicted in art. The fashion exhibits were really interesting. 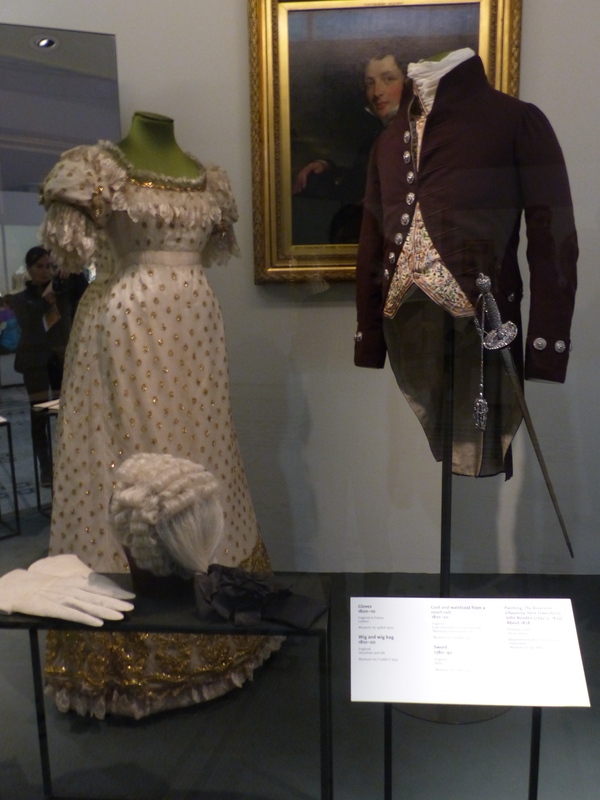 I liked these period styles, which made me think it could have been Elizabeth Bennett and Mr Darcy wearing these. One of my favourites though, were these woollen bathers from the 40’s and 50’s. How on earth could you have gotten wet wearing those! They would have weighed a ton, not to mention getting very saggy, once all that wool took a soaking. How did they stay up and you not end up with a saggy baggy bikini bottom hanging down to your knees!? It was such a wonderful place to spend time and it’s the sort of museum I could return to for days, there was so much there to see. I’m looking forward to the continuation of the visit tomorrow. That was today in London. A leisurely one, but an enjoyable one and we did get a little bit of sunshine before the day’s downpour. We have one more full day, before moving on, to explore Britain the Great once again. Now I just have to find me one of those wide-load dresses…could I ride a bike in that, I wonder? You have to love a fashion style that lets you have a bum like the back end of a bus! You have to love that!